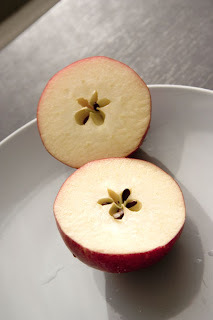 Cut an apple in half across the centre to reveal a 5 pointed star (mine looks like a flower too). To find out which beau (or belle) loves you the most take out two pips and call each one a name of two possible loves. 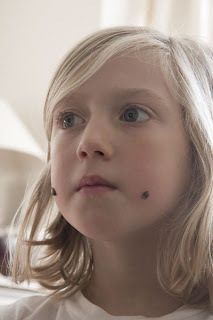 Press one each side of your cheeks. The one to stay on longest is the one who loves you the most. Wishing you all happy festivities. Oh such a serios face I guess the answer is really important. We used to try and peel an orange in one piece, fling the peel over our shoulders and it was suposed to land in the shape of the intial of the one you were going to marry. Oooh! We will have to try that one tonight. We'll be commencing the Great Pumpkin Carving Ceremony in a minute, and looking forward to a non-traditional halloween fayre of noodles and bbq pork tonight (take-out - our oven is broken!!). I've never heard of this. I shall try it and tell my husband he needs to buy me more wine if his one falls of! Haha! I've not heard this before...and like Louise, I don't recall cutting an apple like this either - it's worth it for that beauty alone! I've never seen that one before. We used to do something similar where we would twist the stalk of the apple with each twist working through the alphabet and when the stalk came out that was the first initial of the person that loved you. Then we would take the stalk and stab it into the apple skin, again going through the alphabet with each stab until the stalk pierced the skin giving us the second initial! Enjoy Halloween. Must try this. Would pumpkin seeds do instead? I have got big cheeks for them to adhere to!!! Gingham and flowers beat me too it. That's what we did at school, if only I could remember those initials! Great post, I love old wives tales like this. No doubt my 4 yr old will have to try. She already tells me who she's going to marry, however I think it may well be a problem as I'm pretty sure he's gay. Lots of heartbreak ahead I think!!! That's interesting Ginny ~ I've never come across it before either. I love the photo of the apple ~ I cut apples like this and dry the slices at Christmastime. I'm loving your book ~ haven't had time to dip into it for a few days, but I'm hoping to catch up this weekend. Hi Ginny...I love your book, it is beautiful, I love the draught excluder..will definately have a go at making one of those. When I saw the way you had cut the apple I thought it was going to be for dried apples...something else I was going to have a little go at. Hi Ginny. Fiona here again. I can't find your email to get in touch but just wanted to say thanks for your comment and your offer to refer people to me for curtain making. I think the easiest thing is to give any potential people my website address as I have a contact form on there. And yes, the reunion with Simon was lovely! Very glad to have him home!